While roaming around the walled city of San Gimignano, outside of Florence, Bob came across a dog in an old-fashioned pharmacy. He was dazzled by this puppy and found out that it was a Cane di Tartufo (a truffle dog). Back home, Bob started to research the Logotto Romagnolo breed. Bob travels to Italy twice a year and, during this search period, would drive to the Marche region to meet different breeders. He finally settled on Lorenzo Ciacci, a breeder from whom he got his first Lagotto. That puppy was Gigi, sired by Lorenzo's world champion, Alan. Gigi had company on the trip to his new home in Connecticut. Bob had arranged to buy a second puppy, a female named Meta, to surprise Linda’s recently widowed mother. Gigi and Meta quickly became our much-loved pets. Gigi stayed with us, and Meta lived with Linda's mother, Esther, who passed away in 2007. After Esther's passing, Meta moved on to be a wonderful companion to another widowed lady on Long Island. Meta had a wonderful life with an adoring community around her. She became a certified service dog and spent many hours visiting and comforting hospital patients. We knew that puppies require serious training and feel blessed to have found the late, great Donna Malce. Her passion for dogs was contagious. Thanks to Donna’s guidance and classes, Gigi and Meta became well-trained dogs. The training served them well as they went on to compete in American Rare Breed Association (ARBA) shows, where they both became champions. Additionally, Gigi competed in ARBA’s biggest show, the Peachtree Classic, in Atlanta and became a group champion. Gigi traveled to Buenos Aires in 2005 to show in the Federation Cynologique Internationale competition and became the World Champion Junior Lagotto. With the ribbons, rosettes and Championships came the birth of Buonamici Lagotto, and the many good friendships we have made along the way. Our dogs have been featured on Animal Planet’s Dogs 101 Rare Breeds show. 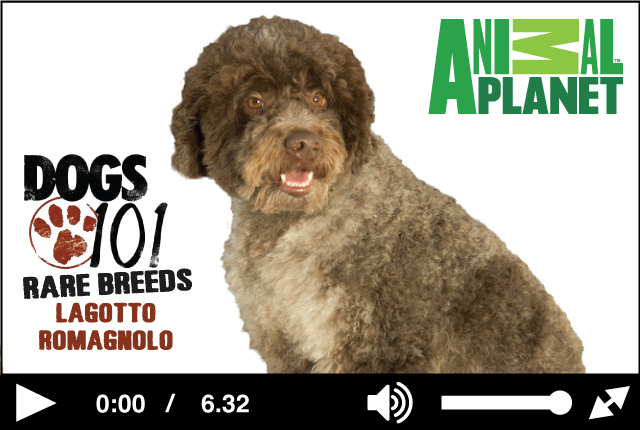 In the television program, Champion Gigi guides the viewer through the wonderful world of the Lagotto Romagnolo. Our puppies from the spring of 2009 are also highly featured in the program, as are Iris and Sally, both wonderful Lagotti imported by us from Italy. Our philosophy on breeding is built on what we call the 3 T's: Temperament, Temperament, Temperament! temperament foremost in our thoughts. We have not and will not breed a dog with a questionable temperament. We pay attention to the overall health of our puppies and go the “extra mile” to ensure that, when they leave us, they are healthy, well-adjusted and socialized puppies. We want our puppies to be exceptionally successful in their new homes and with their families. Our puppies are wormed, vaccinated, micro-chipped and examined by our veterinarian before they go to their new homes. Additionally, we require that the new owner have the puppy examined by their own veterinarian for an independent evaluation of the puppy’s health. He kept Gigi and Meta in line and taught them English. He learned a bit of Italian from them as well. Mostly begging tricks but still in Italian. Sadly the Pupster is no longer with us but he is the one that started us on this journey and will always be a part of us. Please fill out our Puppy Questionnaire and we will call you within 48 hours to discuss what we have available or planned. Also be sure to watch the Dogs 101 Animal Planet video - our dogs are featured in it! We would be happy to help. Please fill out this questionnaire and we will get back to you.